This entry was posted in St Mary and St John Primary School on November 13, 2018 by North Luffenham. We provide a wide range of challenging, imaginative, and stimulating learning opportunities. We work closely with Reception class to provide a smooth transition into school. 15 and 30 hour funding available. 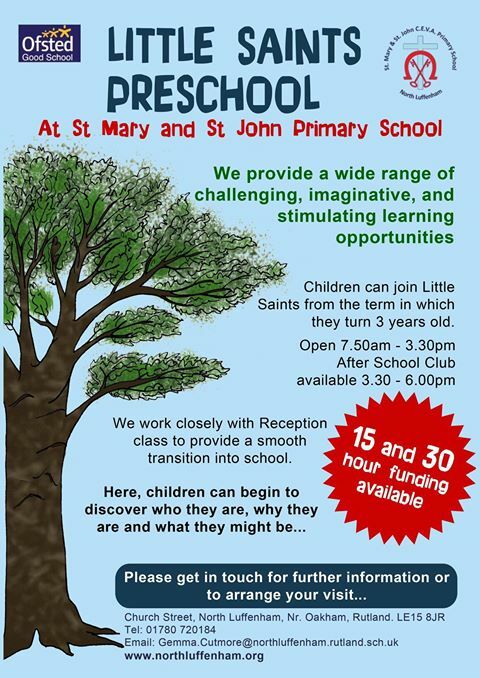 Here, children can begin to discover who they are, why they are and what they might be…Children can join Little Saints from the term in which they turn 3 years old. After School Club available 3.30 – 6.00pm. Wrap around care available from 7.50am-6.00pm. 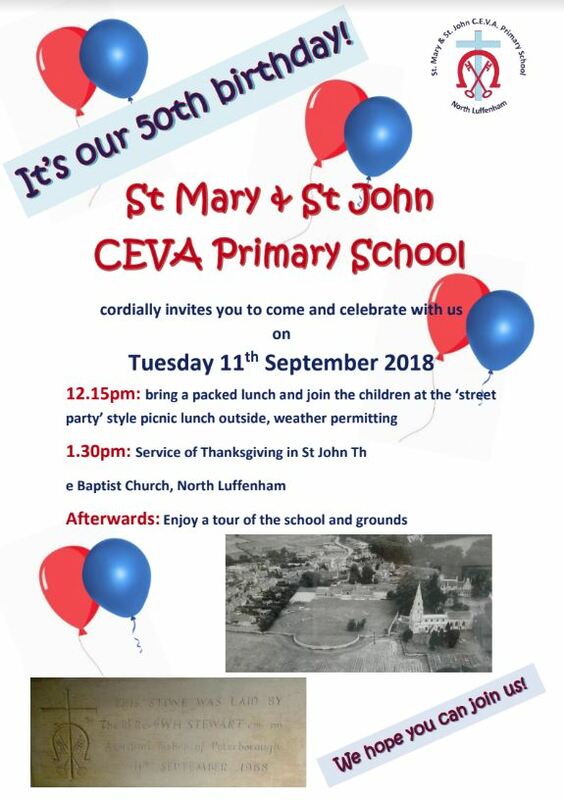 This entry was posted in St Mary and St John Primary School and tagged School on May 13, 2018 by North Luffenham. This entry was posted in St Mary and St John Primary School on November 7, 2017 by Pete Burrows. 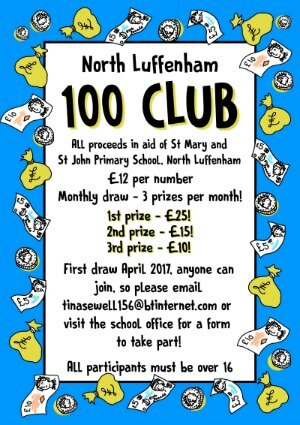 St Mary and St John Primary School, North Luffenham, is opening up its 100 Club to the village and inviting new people to join in and take part. This is a fantastic way to support your local school, whilst having a bit of a flutter! For £12.00 per year (only £1.00 per month) you can take part in a monthly draw to win 3 prizes, from £10.00 – £25.00. After prize money, the remaining profit from the 100 Club goes to the school via the PFA to help fund equipment, resources and opportunities for the children. There are a limited number of places available, but the good news is that anybody can buy a ticket, whether you live locally, are a parent, or a friend of the school, and you can buy as many numbers as you like! All participants must be over 16. This entry was posted in St Mary and St John Primary School and tagged School on March 22, 2017 by North Luffenham. This entry was posted in St Mary and St John Primary School and tagged School, Xmas on November 4, 2015 by North Luffenham. Fun and Games at North Luffenham School! 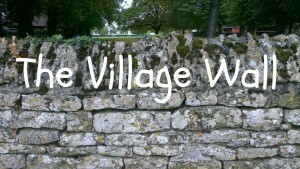 On Saturday July 5th The North Luffenham Primary school fete will be held from 2 pm to 4 pm. 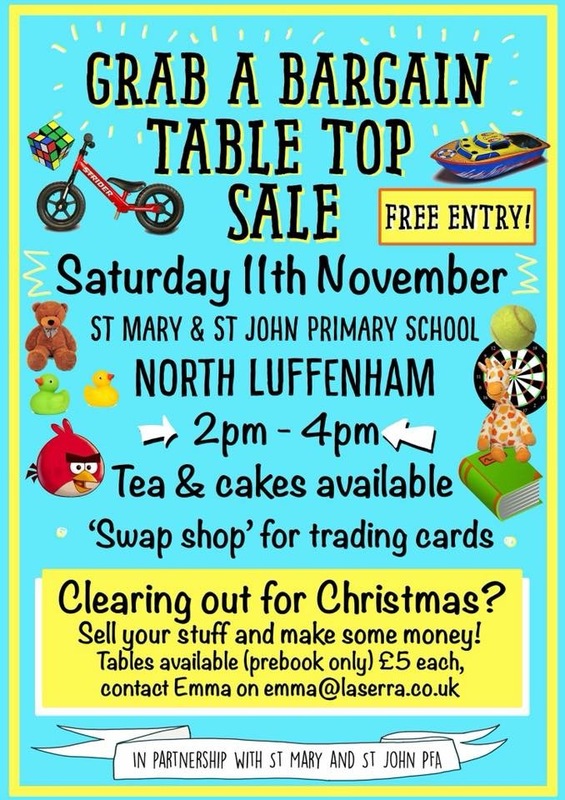 There will be fun, stalls, things to buy and games to play. This entry was posted in St Mary and St John Primary School on July 2, 2014 by Ian Ferguson. This entry was posted in St Mary and St John Primary School on June 6, 2014 by Ian Ferguson. North Luffenham’s pre-school Christmas gift evening will be on Friday 22nd November, 7pm – 9pm. Exhibitors will include Swans, The Design Mould, Sarah Harding Phoenix Cards, Tip Top and Norfolk Cordials, to name a few. Entry is free and 100% of proceeds go to the pre-school, making a lot of little people, very happy. Join us at the community centre to stock up on Christmas gifts and stocking fillers. 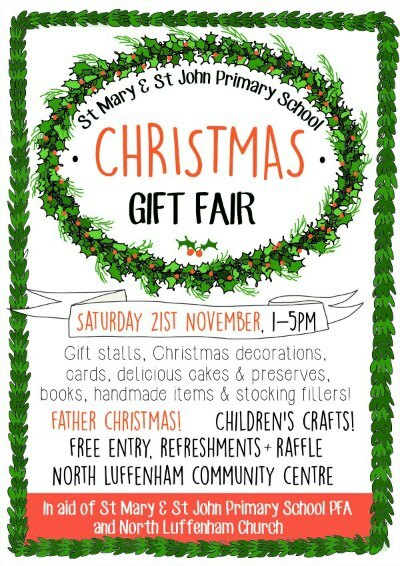 This entry was posted in St Mary and St John Primary School and tagged Events, School, Xmas on October 24, 2013 by North Luffenham. 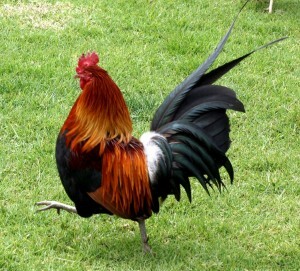 Do you have…I say, do you have a Cockerel missing? The real missing Cockerel moved to fast for the camera, so this is a close…ish photofit resemblance to the Cockerel that has gone AWOL. Foghorn Leghorn (aka a Cockerel) has taken up residence in the school field, and it has..I say, it has now outstayed its welcome! It must belong…I say, it must belong to someone, and the school would really like to see it leave! If you know who…I say, if you know who the Cockerel might belong to, please ask them to contact the school office on tel: 01780 720184 to arrange collection. This entry was posted in St Mary and St John Primary School and tagged Birds, Missing, School on May 17, 2013 by North Luffenham. St Mary & St John Primary School will be holding a FREE Multi Sports Easter Holiday Club. These sessions will include various different sports throughout the week including football, tag rugby, tennis, athletics, hockey, netball and kwik cricket. 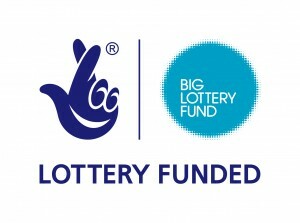 The clubs will be run by a qualified and CRB checked sports coach and will be completely free of charge thanks to a lottery grant. Children must bring appropriate sports clothing, drinks and snacks (if they wish). Key stage 2 children should also bring a packed lunch. Places are limited to 15 children per session. Further details and booking forms are available from the school office. This entry was posted in St Mary and St John Primary School and tagged Free, Holidays, School, Sports on March 17, 2013 by North Luffenham. St Mary & St John Primary School will be holding FREE Keep Fit for Adult classes on Friday afternoons from 2.30pm to 3.30pm. Open to everyone – NO CHARGE Come along and get fit for the summer! Sponsored by the Big Lottery. This entry was posted in St Mary and St John Primary School and tagged Fitness, Free, Health on March 15, 2013 by North Luffenham. 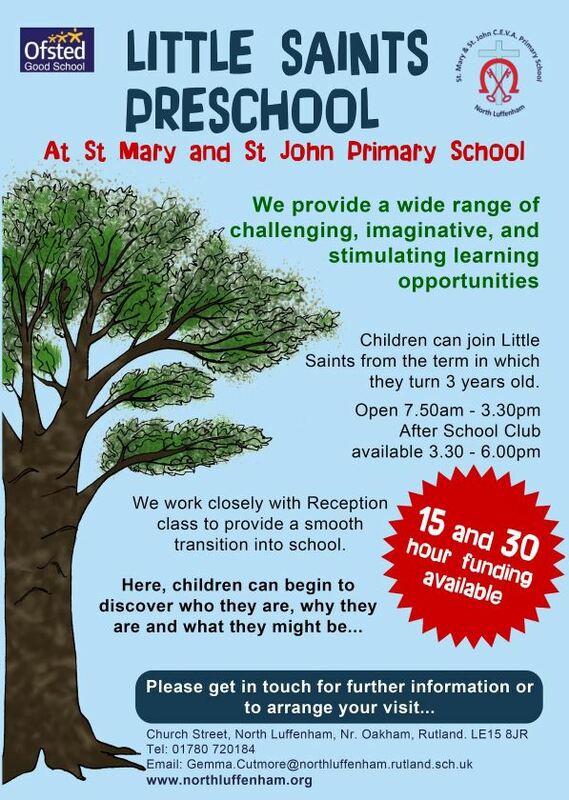 We are going to be running a SATURDAY MORNING FOOTBALL CLUB AT ST MARYS & ST JOHN SCHOOL, NORTH LUFFENHAM. The sessions will be open to BOYS & GIRLS from the ages of 5 to 11 years, regardless of their ability! The sessions will start at 10.00 and run through till 12.00. Head Coach, Glenn Vaughan is a Centre of Excellence coach and scout for Peterborough Utd Football Club. There will be a chance for promising players to be invited in for a trial. Whether your son or daughter is a beginner or experienced players, the club will cater for all!!! The sessions will be taken by qualified, CRB checked, experienced and caring coaches. The sessions will offer the chance to practice passing, dribbling, shooting and some of the skills the professionals use today. It will be run in a fun, safe, educational and relaxed environment. One Touch Football Soccer School set themselves high standards, giving children interesting & stimulating football sessions so that they leave with a sense of achievement. PLAYERS SHOULD wear suitable footwear and clothing (shin pads are recommended). The Saturday morning club will run throughout the academic year starting on 6th October, we will then charge £3.00 per session. Download and fill in the consent form below and hand back to the school office or bring it along with you on the Saturday morning. PARTICIPANTS WITHOUT THE CONSENT FORM COMPLETED WILL NOT BE ALLOWED TO PARTICIPATE UNTIL THIS IS DONE! This entry was posted in St Mary and St John Primary School and tagged Football, Learning, School on January 18, 2013 by North Luffenham.